This was supposed to be the entry for St. Patrick’s Day, but I wasn’t able to complete it. 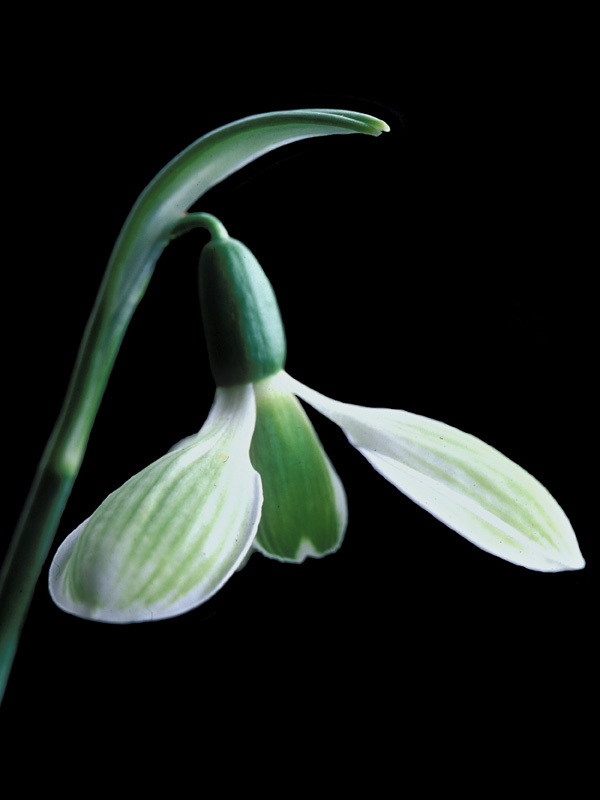 As it turns out, though, two people have sent me Galanthus related links in the past week, so it is perhaps a bit of serendipity that I now have the opportunity to include them with the entry. Today’s photograph is courtesy of Paddy Wales (do check out her photographs!). I do need to admit to adjusting the background with Photoshop to make it black – this image is from a scanned slide, I believe, so the original had a noticeable halo effect in areas of high contrast, which I’ve edited out. Then again, considering the nature of art, it’s possible I erred gravely in doing this as the halo might have been intentional and done “in-camera” – so Paddy, when you see this entry, please let me know if I should have used the original, and I’ll switch it as soon as I’m able (and please accept my apologies for not having communicated with you about this beforehand!). This plant was growing in the garden of Kathy Leishman. Paddy took the photograph to accompany the plants that will be available in the 2007 Collectors’ Plant Auction (list of plants) organized by the Friends of the Garden (FOGs) to support two of the garden’s new projects, the Carolinian Forest and the Garry Oak Meadow and Woodlands. Why does this bulb plant merit inclusion in the auction? In addition to the inherent beauty of snowdrops, there are some shades of tulip mania in that it is extremely difficult to acquire some cultivars due to limited numbers. Galanthus ‘Rosemary Burnham’, in fact, is mentioned by name by Adrian Higgins in a Washington Post article from Thursday: “Melting Over Snowdrops – A Little Bulb’s Popularity Enjoys a Growth Spurt ”: “It is the development of novel varieties that has helped to give snowdropping its current cachet… the two priciest bulbs in Grimshaw’s catalogue are about $70 each. One is a variety of the giant snowdrop named Rosemary Burnham, with green petals (technically perianth segments)…” (thanks Beverley for sending this along). I have very few pieces of art hanging on my walls, but one piece is a watercolour of a violet. The painter? Rosemary Burnham. Rosemary is a local artist and gardener (yes, she’s a FOG too), and this cultivar was named in her honour by Don Armstrong. A few more links of note: earlier this week, Eva J. sent me a link to an article from Julie at the Human Flower Project on “Hovirag – Hungary’s Hot Snowdrop”. Through reading the comments, I also discovered Graham Rice’s piece on “Snowdrops Escaping from Gardens – in the UK and USA” on his weblog, Transatlantic Plantsman. Julie’s piece touches on what happens when plants become too cherished. Graham alludes to this as well in the first paragraph of his article, though the main focus is about the naturalizing of garden escapees. In news on the Hydatellaceae, Sean Graham’s radio interview with the BBC World Service is now online via their Science in Action web site. The audio clip is available from today until the early morning of March 30, 2007.